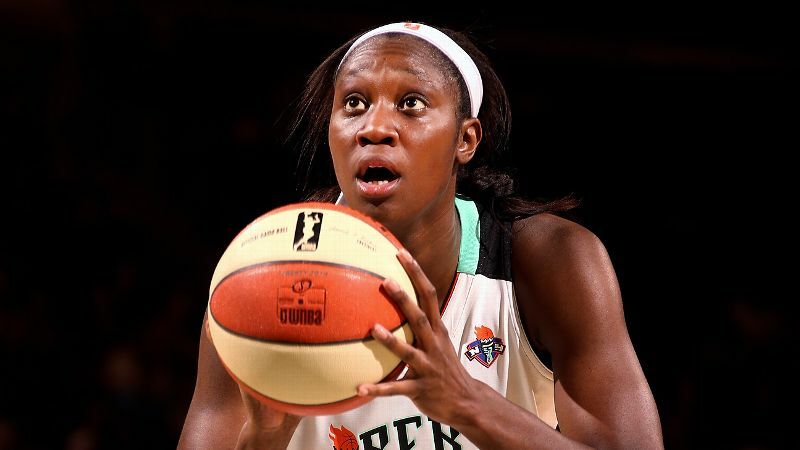 Holly Rowe takes a look at WNBA star Tina Charles' determination to help combat sudden cardiac arrest through her Hopey's Heart Foundation. After the 2013 WNBA All-Star Game at Mohegan Sun in Connecticut, Tina Charles gathered together some of her favorite people for a low-key event in a quiet space away from the casino floor. 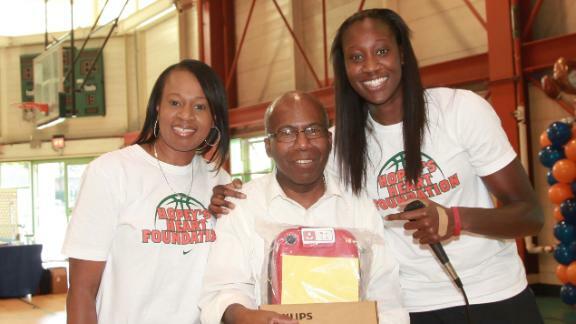 Tina Charles named her foundation to honor her aunt, Maureen "Hopey" Vaz, who died of multiple organ failure in 2013. She was hoping the folks in the room could offer a little something, maybe just an hour of their time, a few dollars, anything at all. These small contributions would then set in motion a chain of events that could, down the road, turn into something priceless -- the saving of a life. Just a few months earlier, Charles had officially launched the Hopey's Heart Foundation, which works to place automatic external defibrillators (AEDs) in schools across the country. And that night at Mohegan Sun, the reigning league MVP stood in front of a group that included fellow UConn alums Diana Taurasi and Sue Bird, as well as broadcaster Ahmad Rashad, and spoke about what the foundation meant to her. Charles told her guests about the loss of her aunt, Maureen "Hopey" Vaz, who had died of multiple organ failure on March 9, 2013. She spoke fondly about her aunt's giving heart, and how she wanted to start a foundation in Hopey's name to honor her legacy. She also shared a story that had deeply touched her when she read it, about a high school basketball player in Michigan named Wes Leonard. Minutes after a game in 2011, Leonard died of cardiac arrest because of an enlarged heart. Perhaps if an AED had been present in the gym that night, he might have lived. The aim of Hopey's Heart Foundation is to save lives. 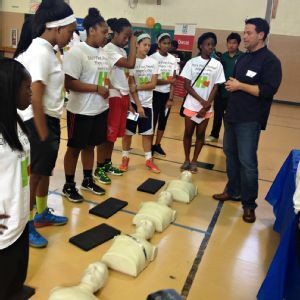 That includes instruction for youth in how to perform CPR. Stirred into action, Charles had made a donation of $14,775 to the Wes Leonard Heart Foundation. And after her aunt died, Charles found herself connecting the dots between their stories: Leonard had died of an enlarged heart, and Hopey had possessed a generous heart. So Charles launched her own foundation in an effort to ensure that someday every gym in America will be outfitted with the necessary medical equipment to help someone, athlete or fan, who suffers from sudden cardiac arrest. Now, a little more than a year after its launch, Hopey's Heart has placed more than 100 AEDs in schools across the country. Thankfully, none has been used yet. "This foundation is like my baby," 25-year-old Charles told espnW recently. "Scoring points is my job; it's what I'm supposed to do. But with an AED, you're able to save a life. This is just something from my heart, and any accolades I receive about my work in the community mean more to me than the MVP award I won." On June 13, Charles was presented with the WNBA Cares Community Assist Award. In addition, she has pledged to give half of her 2014 league salary to Hopey's Heart. That's a donation of more than $50,000, as Charles will earn about $105,000 playing for the New York Liberty this season. The gift, coupled with the estimated $48,000 already raised through events such as the one after the 2013 WNBA All-Star Game, ensures that Hopey's Heart has the resources to continue working toward increased athlete safety. Charles says the cost of each AED is between $900 and $1,200, and the foundation's goal is to place at least 100 per year, while raising awareness about the issue. "Right now, I'm also trying to do work overseas," said Charles, who will play for Fenerbahce, a club in Turkey, this winter. "There is not one AED over there in any gymnasium. The only time we have medical attention is during a game, but many times cardiac arrests happen during practice, when there is no medical equipment around." When she goes to Turkey this fall, she will bring an AED with her. In April, Charles requested a trade from the Connecticut Sun to the Liberty. The 6-foot-4 center was born in Queens, and she wanted to be closer to her family during the season. 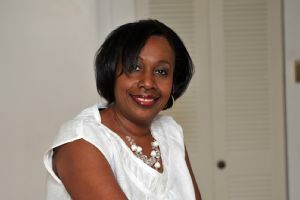 Her mother, Angella Murry -- Hopey's younger sister -- serves as executive director of the foundation. "Tina is all about the community and giving back," said Liberty assistant coach Katie Smith. "She's kind of an unassuming, quiet presence. It's never a look-at-me type of thing. It's a sincere gesture from someone who has taken her success and is making an impact in different ways." Charles hopes that someday all athletes, everywhere, will be able to play the game with the peace of mind that, if anything bad should happen, the proper equipment will be on hand, hopefully preventing another tragedy like the one that struck the Leonard family. "I wanted something to exist in my aunt's name because of the impact she had on me and those around her," Charles said. "She was good, kind and thoughtful, and I wanted to display those things in her name." For more on Hopey's Heart, visit the foundation's website: www.hopeysheart.org.